This Jupiter Farms home, located on a double lot at 9417 Whippoorwill Trail, has been recently reduced from $589,000 to $585,000. The completely renovated interior features three (3) bedroom, two (2) and a half bathrooms with wood grain tile throughout each room. 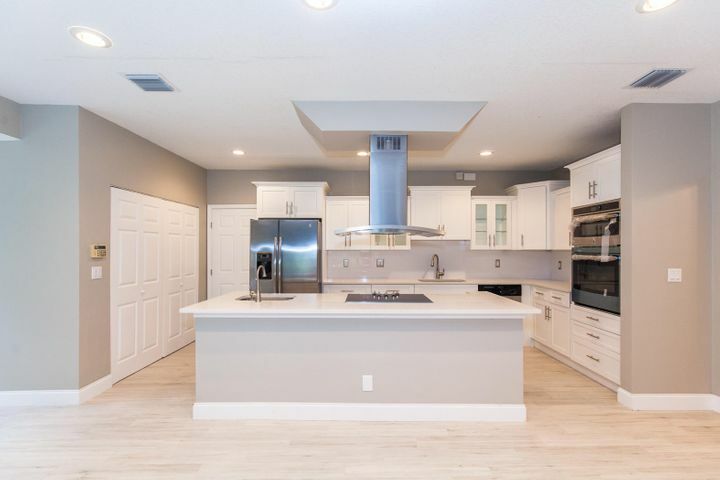 Stainless steel appliances and a large center island can be found in the remodeled kitchen. Enjoy the dual fire place, which can be seen from the great room and the family room, on either side of the wall. The screened in pool and patio has plenty of room for outdoor dining, lounging, or entertaining guests. Additionally, this home has a 1200 square foot detached garage that can fit up to four cars! This home really is something you have to see in person so book a viewing with a Distinct Estates agent today.